This addon displays a map using OpenStreetMap and Leaflet. Dragging the map will set the position of the map, and clicking the map will set the position of the marker. The marker can be set on(displayed) or off. Message - the message shown on the marker. Appears if Marker is on. Expert Mode - a mode where you can specify these values by entering the number. 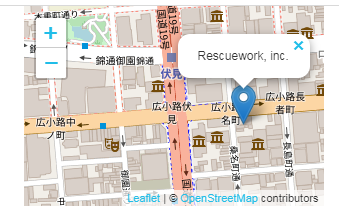 optionally, you can display a marker and the popup message on the map. Leaflet is developed by Vladimir Agafonkin and contributers, distributed under BSD 2-clause License. This addon is distributed under MIT License. Leaflet is distributed under BSD 2-Clause License.